A local inventor and businessman will have his 15 minutes of fame tonight. And each of those minutes will be measured by his unique, eco-friendly clock. The Bedol Eco-Friendly Water-Powered Clock will be presented to Golden Globe nominees tonight on the television show "Access Hollywood," said Mark Bedol, the clock's creator. Bedol has stores at The Shoppes at Chino Hills and in Claremont at 456 W. First St.
"I am waiting anxiously to see the show because, from what I understand, 'Access Hollywood' really is going to give us a nice bit of publicity," said Bedol, who lives in Claremont. The show will air at 7:30 tonight on KNBC (Channel 4). 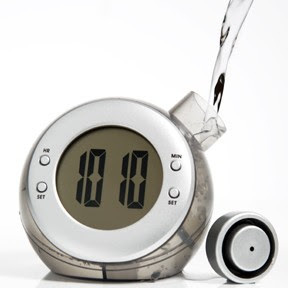 The clock - which is powered by tap water and lemon juice - is a brightly-colored timepiece with a circular design. The clock eliminates the need for batteries. Bedol holds a number of patents for different designs. They include the Checkmaster, which is a checkbook calculator that can simultaneously balance three checking accounts, he said. Bedol also has designed a line of school supplies. so i went ahead and created a junior pande myspace page.